The text part of this book describes technical specifications of the ship and her operational history in detail. This is accompanied by more than 100 color illustrations showing Lutzow's appearance during Operation Rösselsprung, July 1942. The text part of this book describes technical specifications of the ship and her operational history in detail. This is accompanied by more than 100 color illustrations showing Lutzow's appearance during Operation Rösselsprung, July 1942. Elements that are shown in detail include armament, rangefinders, radar, searchlights, catapult with aircraft, etc. Blueprints in 1:350, 1:200, 1:100 and 1:50 scales (general views and details) are included on a separate sheet. 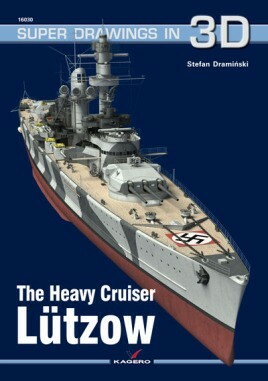 This publication is an invaluable help to any modeler working on this ships' replica.